The Danish/French/Swiss melodic metal-band NOW OR NEVER have signed a record-deal with the Danish metal label Mighty Music. The band consists of Ricky Marx and Kenn Jackson (both ex-PRETTY MAIDS), Jo Amore (ex-NIGHTMARE) and Ranzo (ex-SULTAN). The new track “Sonic Ecstacy” is the first single from the forthcoming third album II, which is set to be released on February 26th and you can check it out below. 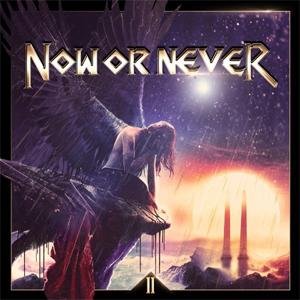 NOW OR NEVER was founded in 2012 by guitarist Ricky Marx (ex-PRETTY MAIDS) and drummer Ranzo, to be joined soon after by vocalist Jo Amore (ex-NIGHTMARE), and bass player Kenn Jackson (also a veteran ex-PRETTY MAIDS member). Short after, NOW OR NEVER recorded their self-titled debut album at the Peek Studio in the South of France, co-produced by the band and Pat Liotard. Their eponymous debut album was released worldwide on the Mausoleum Records label, early in 2014 and got a very good response from the hard rock scene and good international reviews by the press. Already in the fall of 2015, NOW OR NEVER entered Peek Studio and finished recording their second album II, again co-produced by Pat Liotard. Ricky Marx is an inventive and experienced guitar player, who was a fulltime member of PRETTY MAIDS and recorded two albums with them. He’s also an experienced producer and accomplished songwriter. Kenn Jackson was also a fulltime member of PRETTY MAIDS for nearly 20 years and has recorded more than 13 albums together with the legendary Danish act. Jo Amore is originally a drummer, but traded in his sticks for a microphone. He was the vocalist for the successful French Metal band NIGHTMARE, with whom he recorded a dozen or so albums, as well as performing on major festivals and venues all over Europe and the US.